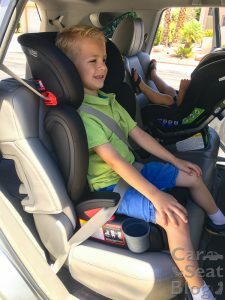 In an effort to make more affordable and accessible products, earlier this year Britax introduced its Essentials by Britax line of carseats. 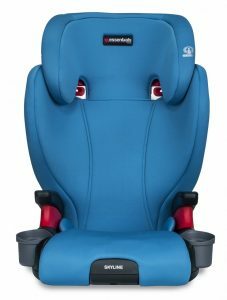 However, they found that the buying market still found the Britax name to be the big draw, so they dropped the “Essentials by” part so that will slowly fade into the past. 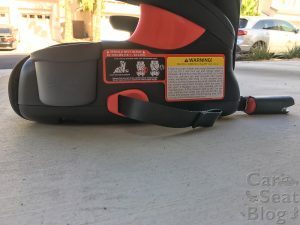 The base model belt-positioning booster for Britax is called the Skyline and is based on the Britax Highpoint booster seat, but with fewer features and a smaller price tag to show for it. A review on the Britax Highpoint can be found here, and here’s a top-down pic to show the basic differences between the two seats (Skyline is black, Highpoint is blue). 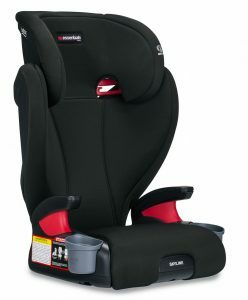 Britax has a mid-level booster, called the Midpoint, that does not have side impact cushions but does have unique breathable fabric and the SecureGuard™ Belt Positioning Clip. For more measurements, see our comparison database. There are 2 fashions available, Dusk and Teal. Since this is Britax’s more affordable line, you’ll be able to find these boosters at stores like Target and Wal-Mart, and at local Brixy retailers as well. The only assembly required for the Skyline is adding the cup holders, if desired. The booster comes out of the box in once piece and cannot be used backless, so there is no putting the back onto the bottom piece. The bonus to this is that it stays together when you carry it! Seat belt fit is very good; lap belt fit is aided by thick armrests that push the lap belt forward onto the thighs. Shoulder belt fit is adjusted by squeezing a handle on the back of the headrest and lifting up or pushing down. The Skyline is one of the tallest on the market, so it will be a good option for kids with tall torsos. 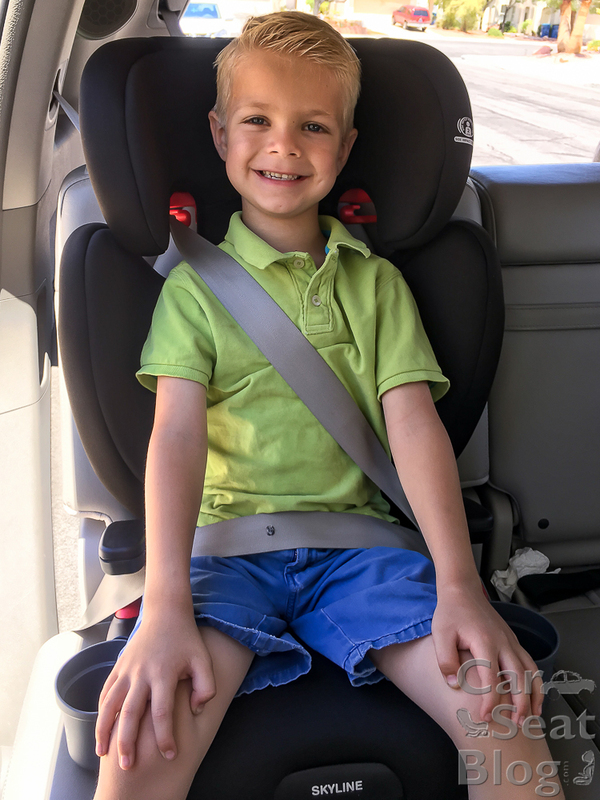 Be sure to adjust the headrest so that the shoulder belt guides are above your child’s shoulders and his ears are inside the headrest. The label just above the shoulder belt guide helps you with placement. My model liked the Skyline and found it comfy. S is 5.5 years old, 40 lbs., and 44″ tall. Check your vehicle owner’s manual to see if you can install the booster using the lower LATCH connectors. 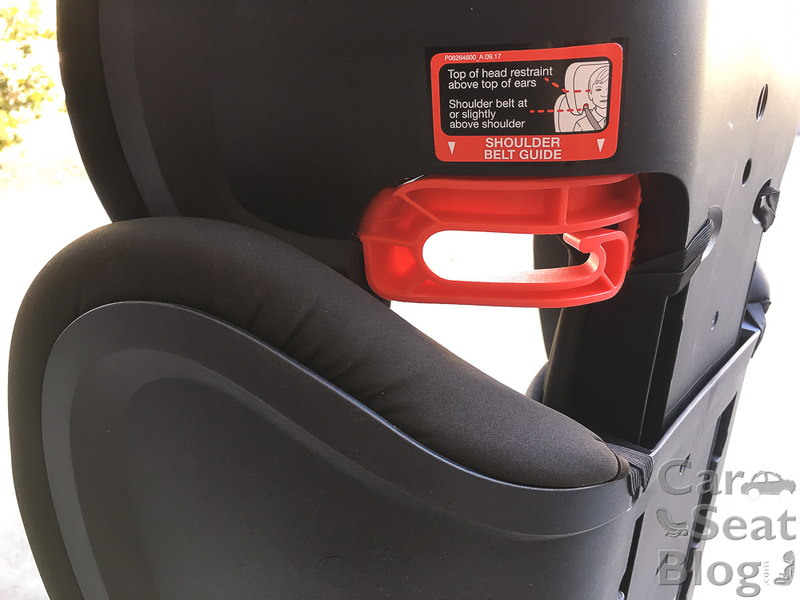 This is an optional feature that keeps the booster in place when the child is not in the seat; otherwise, the child should buckle the booster in when getting out of it so it doesn’t become a projectile in a crash. Essentials by Britax suggests hand washing the cover and hanging it to dry. It is fairly easy to remove and has a couple of elastics. 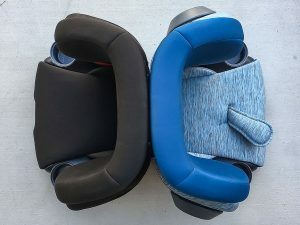 Because belt-positioning booster seats require the use of lap/shoulder belts, the Skyline cannot be used on an airplane. The Skyline has a lifespan of 10 years. 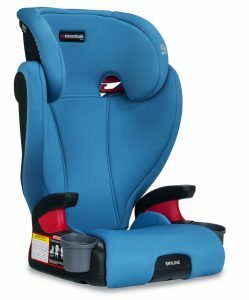 Britax follows NHTSA crash guidelines for replacement after a crash. Despite not converting to a backless booster, the Skyline scores as one of the tallest highback boosters on the market. It is less expensive than the Highpoint, but it also lacks the SecureGuard lap belt clip that helps some kids stay in position when transitioning from a harnessed seat. Not having the side impact cushions on the outside of the shoulder area means that it’s narrower than the Britax Highpoint, but the downside is the loss of a safety feature. When comparing boosters, though, it’s definitely worth consideration. The Skyline sample used in this review was provided by Essentials by Britax. No other compensation was provided and all opinions are my own. Is there a difference in the padding between the Highpoint and Skyline? Nope. The only differences are the fashion colors, external side impact cushions, and the SafeGuard clip. Hi Devon. I also replied to your comment on our other blog post. Yes, there is movement so that the booster can conform to your vehicle’s seat back angle. I never got a click either. The nice thing is that it stays together when you carry it so you don’t have to worry about it flopping.